While we’re still in cool fall weather and not cold winter weather mode, yesterday’s morning bike ride prompted an impromptu solution for staying warm on the bicycle. My balaclava was only a tad big on little Pookie. He was a good sport about the new head gear. I missed having my face covered, but I still had my under-the-helmet hat, so we were both fairly cozy. In fact, he may have found it a bit TOO cozy and comfortable, because he fell asleep on the way home. We’ve just switched to one nap a day, and fearing that an 11:00am bike seat snooze would be disastrous to the real deal, I fought hard to keep him awake — shaking his shoulder, talking and singing to him, and ringing the bell (right in his ear!). He was so out of it, he just turned his head a bit and whimpered at my efforts. I felt like a jerk, but I really didn’t want to jeopardize a good nap later. Not to mention that it was rather difficult to shift with his head on my hand. Anyway, Matthew reminded me that we have an extra small adult balaclava somewhere around here. If we find it, that should work well for brisk days. For really cold weather, I think the trailer will be the warmest spot, since the rain cover turns it into an almost completely enclosed space (save for the vents). We’ll probably still have to draw the line somewhere, temperature-wise, to prevent freezing little hands and feet. 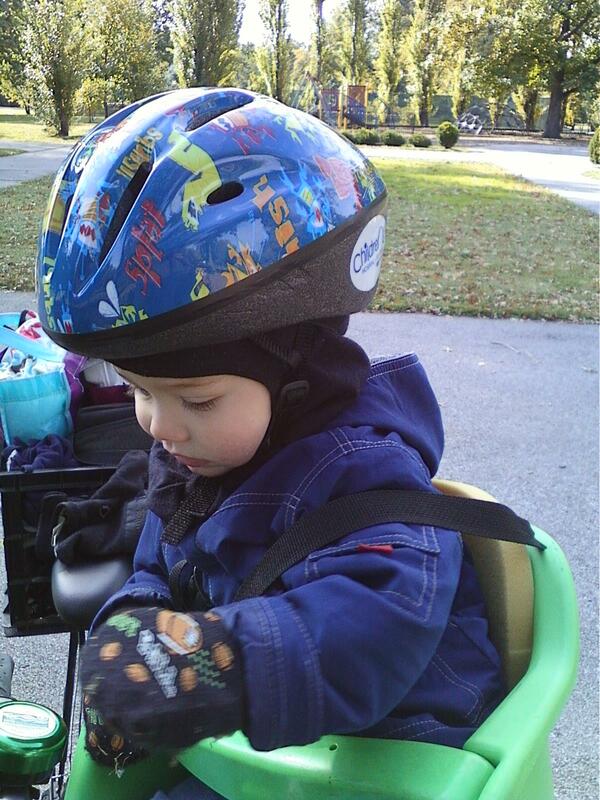 We generate internal heat while biking (and even with that and good mittens and boots sometimes have trouble keeping the extremities warm), but he won’t have that advantage when he’s just along for the ride. Anyone else have a minimum temperature for biking with little ones, or general suggestions for keeping them warm and happy? 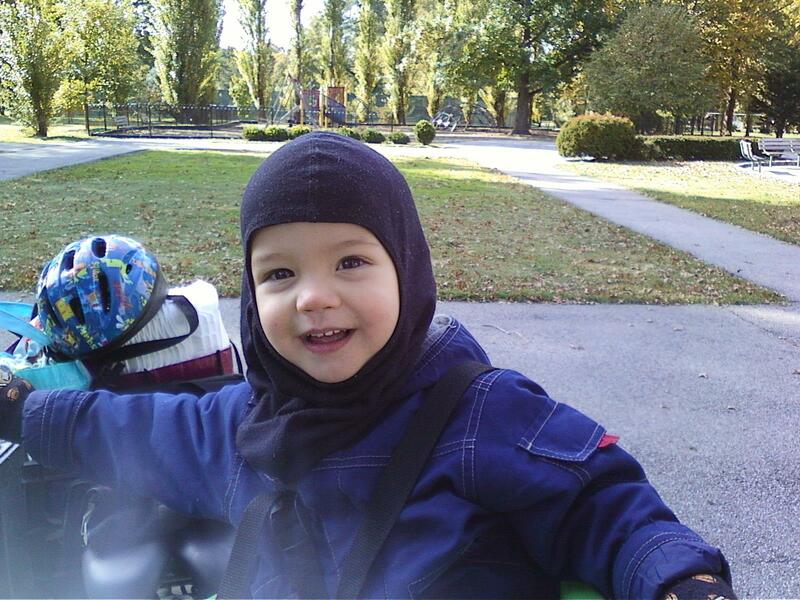 This entry was posted in Biking, Cuteness and tagged biking with baby. Bookmark the permalink. Yes, I really like your set-up for a rear seat. It would cause some visibility problems for a front mounted seat, but if/when we get a longtail, I’ll definitely refer back to this. I thought you or your readers might be interested in a yuba mundo raincover I whipped up. I couldn’t find any on the net so I made up my own. We love it! Would be honored if you’d share it on your site so others could copy and improve the design. Thanks, Andy. I want to rig up something like this for the child seat on our Edgerunner; will definitely do a post and share the link to your site when I do!